To import contacts into Outlook 2011 for Mac, you sometimes need to make a .csv file of your contacts in a different e-mail program. Outlook 2011 for Mac also supports delimited text file formats such as tab (.txt), comma (.csv), and MBOX file formats, which you can use if your old e-mail program is capable of saving in these formats. Select Contacts or Messages from a Text File and then click the right-arrow button at the lower-right corner of the dialog. Import Contacts from a Tab- or Comma-Delimited Text File. Import Messages from an MBOX-Format Text File. Click the right-arrow in the lower-right corner of the dialog to display the Import Text File dialog file browser. Outlook displays the Import Contacts dialog. 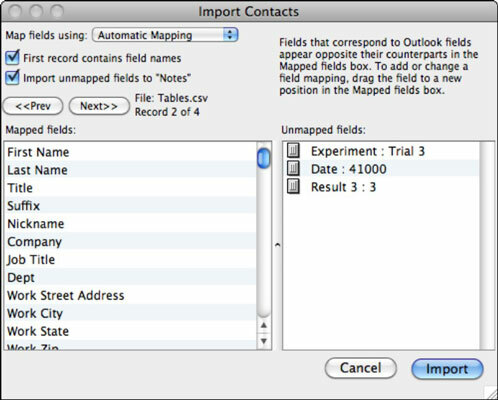 Choose the field names from your old e-mail programs to equate them with Outlook’s fields using the Import Contacts dialog. This maps the old e-mail program’s field names to Outlook’s field names. Click Import and then, in the next dialog, click Finish. Your contacts from the old e-mail program are now in your Outlook Contacts list.